Tommaso and Micol Alfieri have a reputation for distinctive contemporary, yet typically Mediterranean cooking, founded on fresh, high-quality ingredients, skilful preparation and a solid philosophy of food ethics. They will prpare a light vegetarian menu each day, consisting of breakfast, lunch and dinner, with the specific requirements of the xplore participants in mind. All recipes will use only seasonal and regional produce, of a mostly organic or biodynamic origin, specifically sourced from selected local farmers. Vegan participants will also be provided for, if pre-booked. For breakfast there will be coffee, milk, tea or herbal tea, different fruit juices, yogurt, cereals and fruit, bread and butter, an assortment of cheeses and fresh vegetables, plus two daily choices of home made cake: ciambellone, crostata, carrot cake, ricotta-chocolate cake. For lunch they serve a unique plate composed of three especially digestive creations, for example: zucchini balls, spicy buckwheat&vegetable salad, sweet pepper-basil-tomato salad, followed by a dessert of pear&cheese cake with chocolate flakes, or their special gazpacho with crostini, farmer tortilla and Greek salad followed by a water melon-mint-Macedonia, and of course water, as well as a glass of red or white wine. Dinner time offers a special meal each day, including: antipasto, first plate, second plate, dessert and a glass of beer or wine. Here are some of their mouth watering proposals for the Evening Feast: Melanzane alla parmigiana / Lasagnetta al pesto alla maniera Ligure / Carbonara di zucchine rinfrescata al limone / Paccheri al pomodoro confit / Involtini di melanzana con tonnarelli al sugo / Patate al forno con salsa barbecue / Zucchine e carote trifolate con semi di sesamo / Caponata / Insalata mista di stagione con verdure di stagione semi vari e citronette / Desserts: Panna fragole e cioccolato / Cialde al pistacchio con ricotta montata e gocce di cioccolato / Crema al limone con lingue di gatto e melograno / Panna cotta al te verde e lavanda. We aim to make our catering as affordable as possible, while offering you the satisfaction, health benefits and holistic nourishment provided by high quality food. We also wish that the amazing work of Tommaso, Micol and their crew is paid correctly. To keep calculations easy and to avoid food waste, we kindly ask you to book your food online, in advance, together with your registration. Hi, my name is Tommaso, I have been a chef for many years. I am very passionate about good food and organic and biodynamic products. 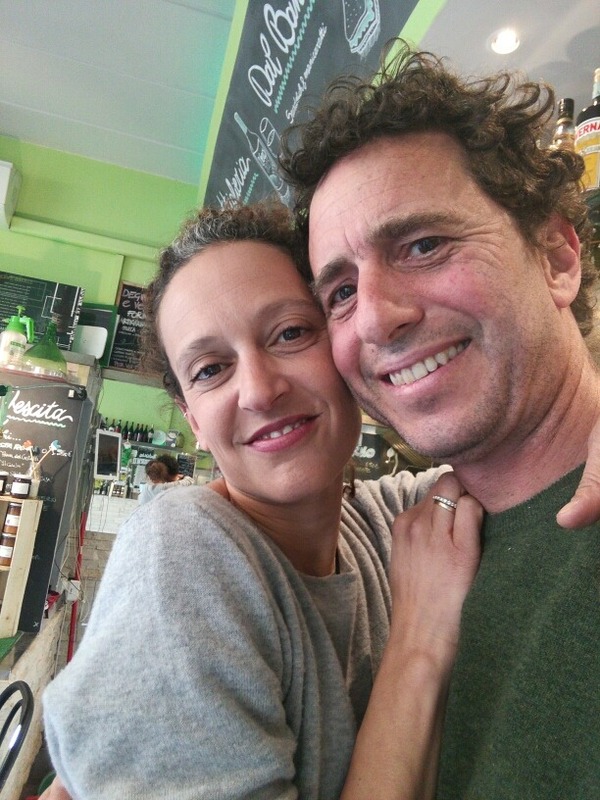 This year, myself and Micol (my talented pastry chef and wife) will take care of your nourishment during the festival. We will come to stay in Borgo Paola to cook for you: our intention is to do our best to provides you pleasure and satisfaction with healthy and fresh made breakfast, lunch and dinner. We promise to offer you a great variety of food to match all your different tastes throughout Xplore Rome 2019. Our meals will be served on natural, bio-degradable plates to be eco-friendly. In order to minimalize any unnecessary waste of food, we ask you to book in advance to prevent any disappointment and so that we can share this wonderful time together.